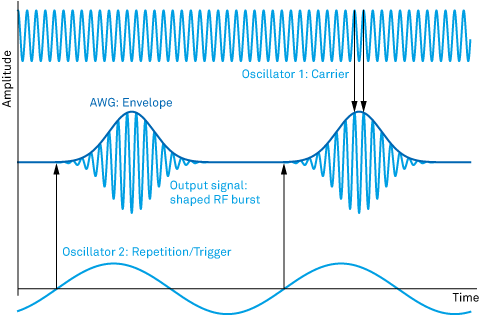 Many AWG applications require sinusoidal signals with shaped pulse envelopes. The UHF-AWG features amplitude modulation, offering independent control over carrier and envelope. Internal oscillators ensure phase coherence during long pulse sequences, independently from the envelope signal generated by the AWG engine. Combining the UHF-AWG with the UHFLI Lock-in amplifier gives pulsed modulation and fast demodulation capability within the same instrument, a powerful solution for pulsed phase-coherent measurements that is unique to Zurich Instruments. The diagram below gives you an idea of the possibilities for output generation. The base version of the UHF-AWG offers the choice between direct output and amplitude modulation of one oscillator per signal output. Adding the UHF-MF Multi-frequency option extends the modulation capabilities of the UHF-AWG with an upgrade to four oscillators per channel. 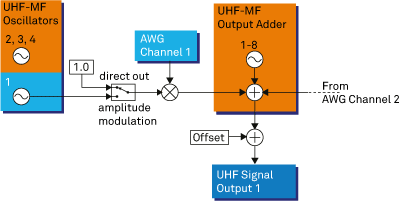 On top of that the UHF-MF output adder offers the possibility of combining the two AWG and pure oscillator signals on a single signal output. Multiple oscillator signals can be added and modulated not only simultaneously but also sequentially by using fast oscillator switching between pulses. This unique feature enables multi-frequency techniques for pulsed laser spectroscopy, NEMS/MEMS and more. Internal oscillators can also act as triggers for the AWG, giving precise control over the AWG pulse repetition rate. The figure below illustrates the signal generation using two oscillators as time bases: oscillator 1 serving as carrier, oscillator 2 defining the pulse repetition rate. In the combination of UHF-AWG and UHFLI Lock-in amplifier, all oscillators can be phase-locked to external sources or, vice versa, used to generate a reference signal on an output channel. This unique feature extends the possibilities when using the UHF-AWG together with external machines such as lasers, scanners, radar or NMR equipment. The rich ways to adjust signal parameters offered by modulation, triggering, and user registers are unmatched by any competing AWG. This saves you time: even with fast communication protocols, rewriting the AWG memory is a lengthy process. Every parameter change that can be done on the fly speeds up the measurement routine dramatically. For applications requiring more channels and/or higher voltages, the UHF-AWG can generate signals on its auxiliary outputs. To this end the AWG resources for one fast channel (1.8 GSa/s) can be reallocated so as to generate four independent signals at 14 MSa/s and 16 bit resolution in a ±10 V range: ideal for driving NMR gradient coils during a pulsed experiment.